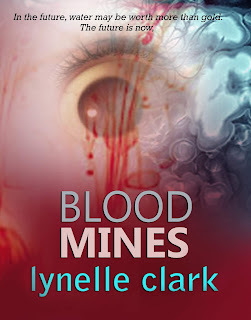 Blood Mines by Lynelle Clark is on Sale. Get your copy today..
Now available for R120 excluding postage. Tanya’s life was turned upside down when her son, Steve was attacked by renegades and she had to dig deep facing her worst fear to save them both. It is the year 2048, 30 years after a devastating quake had changed Gauteng’s geographic features. The effects of the acid water, that covered most of the area, was visible to everyone but the government. The silent death crawling closer leaving devastation in its path. Nothing is excluded from the terror. Tanya and Steve’s path of survival meet up with the rebels in their search for clean water and she had to face much more than just acid water to stay alive. Lynelle Clark lives in Gauteng, South Africa. Her writing career began in 2010. Lynelle has always loved to read books, in which she discovers new worlds. Meeting new people and travelling is one of her passions. So far, the writing journey has been exciting, helping aspiring authors in her free time as she mature.